We are harvesting our apricot crop! 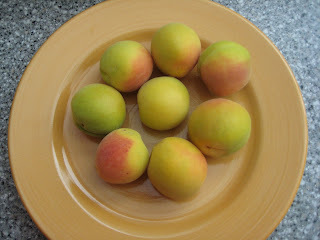 As usual with apricots they all come ripe at the same moment, so a glut of fruit ensues for a short time. 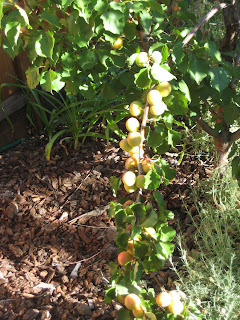 Our neighbours have a huge apricot tree so we can't pass any on to them either. Some of the branches are so weighed down with fruit they are bent quite to the ground. The fruit is delicious and sweet. The boys love them and we are freezing any overripe ones for smoothies - they are great when there are no bananas to thicken a smoothie. I finished the ribby cardi over the weekend. 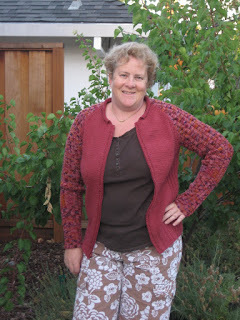 I'm pleased with the sweater: the pattern was really well written and easy to follow, with several styling options (collars, plain vs all-over rib). I didn't make any modifications apart from adding 2" length to the body. The colours worked out well: the sleeves are knitted in ArtYarns Supermerino that I have had for a while (originally bought to knit a vest but underestimated yardage). The body is Cascade 22o in colour 2412 (Rose). 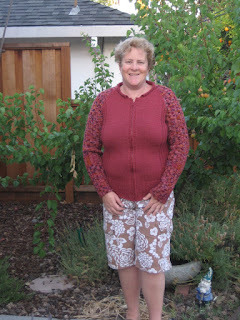 I used the zip insertion tutorial at the Chic Knits web site which worked well. I couldn't get a bi-directional zip, but the one I got from Hancocks Fabrics matches the colour well. Of course I will now pack this away until the weather cools, but I expect it will be a useful addition to my wardrobe. We had a camping trip booked for this weekend, but triple-digit temperatures persuaded us that sleeping in a tent was not the best idea. Had we booked a site in the redwoods we would have been cool enough - but Uvas Canyon is an warmer site near Morgan Hill. So instead we loaded up the bikes and headed off to Wilder Ranch. This was Finlay's first real ride on his bike and he did very well. We did the Old Landing Cove Trail, which is short although the trail is rough in places. It does have the most magnificent views along the cliff tops. The trail ends at Old Landing Cove* where we hunted for sea glass and watched the waves break on the rocks. 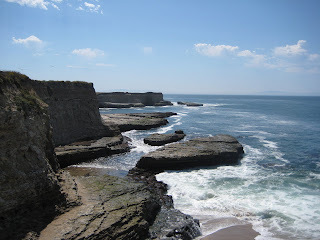 It was over 90 degrees when we drove through Santa Cruz, but there was a fresh sea breeze which kept temperatures very comfortable for riding the cliff-top trail. 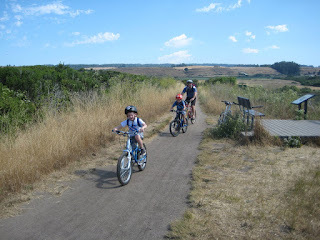 Adam insists that Wilder Ranch is his favourite bike ride - and I tend to agree with him. 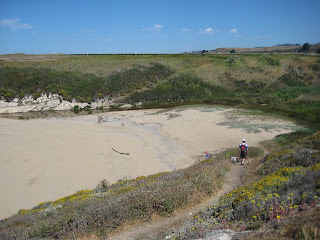 * The trail actually continues the other side of the cove for a short distance, but requires carrying the bikes down the cliff and back up on the other side of the beach. I have done this once, but I think that the effort is just not rewarded by the extended trail. 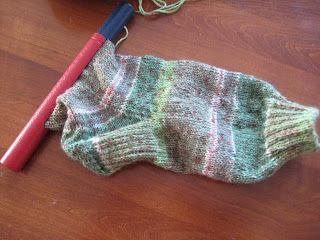 When I was in Rochester I finished a pair of socks for my colleague Lamar. Working, as we do, in a country-level role but with the team spread across North America, I do most of my work on the telephone. Lamar and I work most closely together as our technical specialities intersect, yet we have met only twice in the last 6 years. I'm going to a class in a couple of weeks and Lamar will also be there - so I wanted to mark the occasion with that perfect gift: socks! Knitted in my favourite Austermann Step to my usual recipe. Saturday was WWKIP day and I spent several enjoyable hours with the library group knitting in the library. We had cookies and prizes. However, I didnt take any photos...for those you will have to go to the Library Blog. 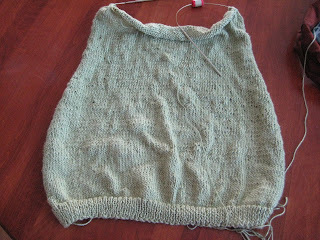 I have finished the back of the Ribby Cardi. This rasberry colour is a replacement for the rather lurid purple that I previously cast on. The yarn is Cascade 220, and although not machine washable, is a better colour match. 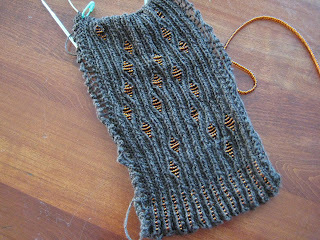 I'm also knitting socks for Nigel out of the new Kaffe Fasset coloured Regia sock wool. I like the hard-wearing qualities of Regia and these colours are fab; bright without being garish. I bought the Regia yarn at Kristens Knits when I was in Rochester. It's a terrific little store with a super yarn and pattern selection. I will certainly return there next time i'm in Rochester. It was a momentous week last week: Adam finished first grade, and Finlay finished Jr K. Both classes had parties to celebrate, but I have photos only of Finlay's party. They had a lunch under the redwoods in the playground. Lunch was followed by a presentation ceremony: Finlay got the award for "Friendship". This rather dark photos shows him receiving the award from his teacher. It was a really nice lunch, his classmates have all been delightful this year. This weekend Nigel and Adam went off on a back-country camping trip. They hiked 2 miles or so into Castle Rock State Park . More details on Adam's blog shortly. Rather than join in with this I chose to stay home with Finlay. We did not, however, lounge around at home all weekend. 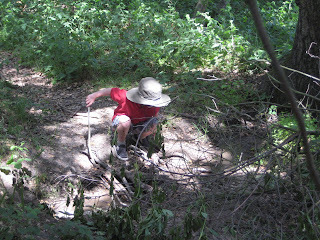 Together with Alison and Henry we did the Monte Sereno Quail Run . This route took us all around our neighbourhood and Alison and I spend the entire time discussing the benefits of the various real estate on the route. We finished up with a pancake breakfast at the school - Finlay certainly got his money's worth of food. Of course the fire brigade and police came so we we got to climb into the vehicles and get a really good show-round of the fire engine, and an account of an exciting moment during the recent Summit Fire. The final excitement for us came at lunch. Finlay and I treated ourselves to lunch at the California Cafe. While we were waiting for our food we were watching the kitchen which is open to the restaurant. The young hip executive chef came out and offered Finlay a tour of the back kitchen which was fascinating. Finlay was most impressed by a giant halibut in one of the two walk-in fridges. The rest of our day was restful...I installed the new PC and Finlay watched a movie...he missed his brother. A favourite local restaurant makes and serves their own home-made limoncello. It's a far step from the typically sweet store bought version. Last time we ate there my mother asked them for the recipe which they happily shared. We went home and harvested some meyer lemons from our tree and started a batch. 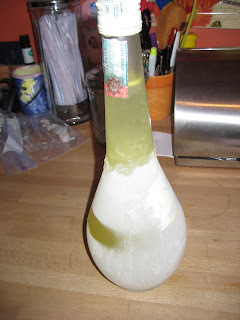 Last week I finished it (it requires 2 weeks of soaking lemon peel in alcohol to extract the lemon oil flavour). It tastes pretty good, and has a nice, not-too-sweet lemon flavour. My version has a very slight bitterness which I think is due to including too much peel rather than zest - but it's hardly discernable and won't stop me drinking it. I'm just makeing a note for next time I make it!! I took this photo without noticing how messy my kitchen looks! I actually went to search for the link after not only seeing a flyer for the SPAM museum in the lobby of my hotel, but also seeing several commercials on the local TV channel for SPAM. Sadly, my week is too scheduled to allow a side trip...it sounds fabulous... "a towering wall of SPAM"! Mainly I'm knitting my silk shrug. The silk knits up beautifully. I had been concerned that I would not have enough yarn - but I have used 2 skeins for the back so I think the 6 skeins that I have will suffice. I have not been doing much on River Rock - here it is in much the same state as it was 2 weeks ago. Finally i've of course got socks on the go...here are some socks for Lamar made of my favourite Austerman Step. I'm travelling next week so will probably take the socks and the shrug so expect to see progress in the next thrilling installment. We have been reading a lot of The Famous Five lately. "Come on Adam, let's play in the garden; it will be simply splendid"
While the boys are loving the stories and the idea that 4 children (and a dog) were allowed to go off on their own for adventures, I am struggling with the rampant sexism, racism, and snobbery. I'm becoming a past master of editing while reading aloud. The books are really very dated now (in the illustrations Julian is pictured wearing a tie! ), but still enjoyable for their gentle adventures.